MADISON - The legislature's Joint Committee for Review of Administrative Rules voted to suspend portions of an emergency rule that would have restricted deer carcass transportation in CWD-affected counties at its Oct. 1 meeting. As a result, carcass transport regulation changes included in the original emergency rule, approved by the Natural Resources Board at its Aug. 8 meeting, are not in effect as previously announced. The 2018 deer hunting regulations and deer carcass movement restrictions webpage have been updated to reflect this change and revert back to 2017 carcass transportation rules. It is important to note that it remains illegal to transport whole wild deer carcasses and certain parts of those carcasses from CWD-affected counties to areas outside of CWD-affected counties, unless these deer carcasses or parts are being transported to an adjacent county or to a licensed taxidermist or licensed meat processor within 72 hours of the deer being registered. This restriction applies to all CWD-affected counties, including those where a baiting and feeding ban is no longer in effect. Proper disposal of deer carcass waste is an effective preventative measure to reduce risk of disease transmission. While the emergency rule has been suspended, Department of Natural Resources staff continue to encourage hunters who harvest a deer in a CWD-affected county to voluntarily keep that deer carcass in the county of harvest or limit movement to an adjacent CWD-affected county, unless the hunter transports the carcass to a licensed taxidermist, meat processor, or landfill through regular waste disposal systems such as curbside pick-up. recommendations for stopping the spread of CWD. Deer hunters play a key role in preventing the spread of CWD in Wisconsin, and DNR staff encourage hunters to have harvested deer tested for CWD and to adhere to baiting and feeding bans. 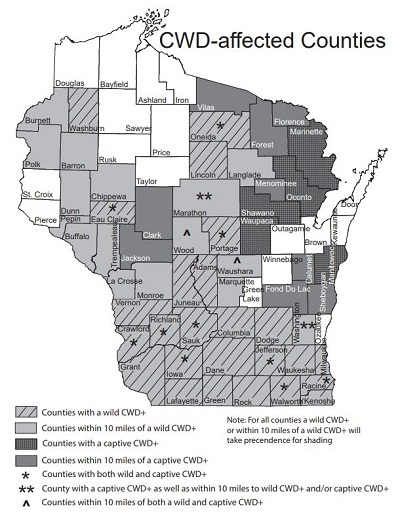 For more regarding CWD in Wisconsin, visit dnr.wi.gov and search keyword "CWD." Good air quality for Wisconsin on Thursday, April 18, 2019 at 1:18 pm CT.